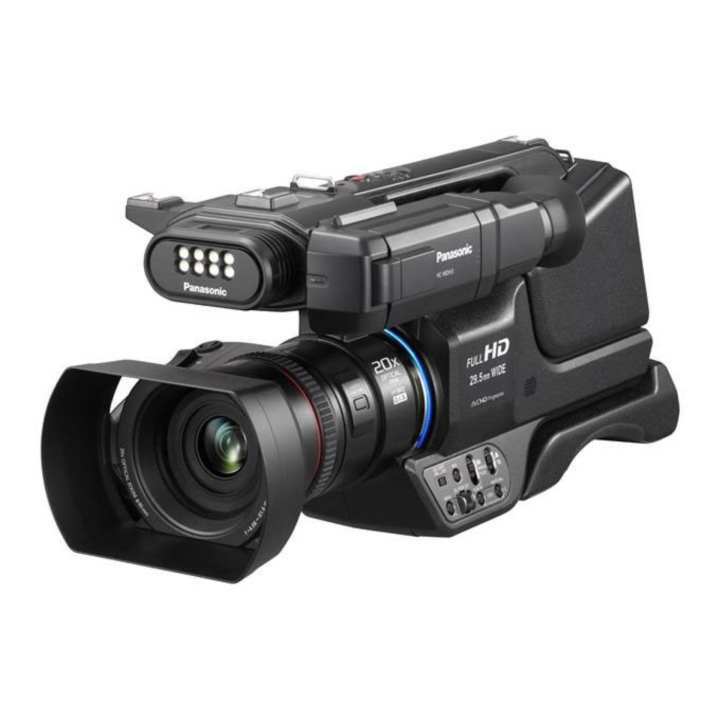 Panasonic's HC-MDH3 AVCHD Shoulder Mount Camcorder with LCD Touchscreen & LED Light is at home shooting corporate, event, or indie projects. It features a 1/3.1" BSI MOS sensor for improved low-light performance, and incorporates a 20x zoom lens with five-axis hybrid image stabilization. The lens also features a single manual ring that you select to control focus, zoom, iris, white balance, or shutter speed. Built into the top handle is an LED light for illuminating your subject. Two viewfinders provide you with a choice of operating the camera with either a traditional tilt-up color EVF, or a pullout LCD high-resolution touchscreen. The LCD touchscreen is positioned above the lens for a more natural viewing experience when shooting handheld. The camera records in MP4, MOV, or AVCHD codecs, and features dual SDXC media card slots, allowing you to use relay or simultaneous recording. The lens incorporates an illuminating ring that indicates when the camera is in standby or record mode. You can also deactivate the indicator if you wish. A built-in LED light illuminates your subjects with a bright beam (300 lux at 3') of daylight-balanced light. If the beam is too harsh, an included diffusion filter covers and softens the light. The integrated 20x optical zoom lens provides sharp images and an equivalent 35mm focal length range of 29.5 to 612mm (16:9). The lens also features a 49mm filter thread. The camera employs a five-axis hybrid optical image stabilizer (O.I.S.) compensating for side-to-side, up-down, and forward-back handheld shake. ভিডিও কত সময় করতে পারব?বেটারি বেক্যাপ কেমন? ha. jodi voucher code use koren & card e payment koren. online e order koren. amar bogura pathai dibo.